"We know too well that our freedom is incomplete without the freedom of the Palestinians…"
"We stand united in our belief that divesting from companies that provide significant support for the Israeli military provides moral and strategic stewardship of tuition and taxpayer-funded public education money. 5º ANIVERSARIO DE LA CAMPAÑA BOICOT, SANCIONESY DESINVERSIONES AL ESTADO DE ISRAEL. (BDS). Occupied Palestine - On July 9 2010, the Palestinian Boycott, Divestment and Sanctions National Committee (BNC) marked the fifth anniversary of the Palestinian Civil Society Call for a campaign of BDS against Israel until it fully complies with international law and Palestinian rights. PSC organised a supermarket action to mark the fifth anniversary of the BNC’s call for boycott, divestment and sanctions on July 9th. Journalists from Channel Four and Al Jazeera joined representatives from some of Britain’s largest trade unions, Unite, Unison and PCS outside Tesco’s in central London to urge shoppers to boycott Israeli goods. PSC handed a letter to the manager of the store at Russell square at the end of the lunchtime action. The Ireland-Palestine Solidarity Campaign (IPSC) used the opportunity International Boycott Weekend to launch a two-week petition drive seeking to enlist Dunnes Stores customers in Ireland to support the call for a boycotting Israeli products. 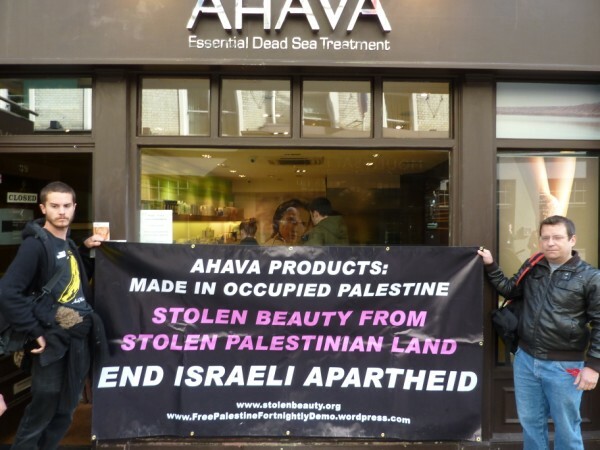 Our aim is to gather more than 4,000 signatures in this short period calling on Dunnes Stores senior management to no longer stock Israeli products.